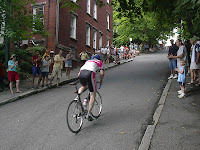 George Street in Worcester, Mass was, for the 7th straight year, the place to be for the annual uphill time trial race in honor of Major Taylor, the 1899 world champion and Worcester resident. 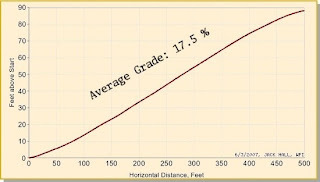 Alpe d'Huez - 7.9% for 13.8 km (about 9.5 miles). Record time was by a doper so who cares (under 40 minutes is good). 143 riders, the most ever in the seven year history of the race, rode the hill with new record times in most categories. This is a real bike geek's event with all types showing up to try their skills. It is the only race where the shaved leg crowd mingles with the fixed-gear messenger types, the bikes-not-bombs types (you know who you are and so does the NSA), BMXers, and cyclo-tourists, and those well past their prime, whenever that was, including myself. There were also more spectators this year than ever before, a lot more than we see at most of the USCF 'offical' events. The new course record was 22.83 seconds set by Rich Hollenbach of Wallingford CT. I didn't do quite so well, but I have a good excuse. Actually, several good excuses. The best one is mechanical failure (of the bike, not me). I plan to remedy that with an all new drive train in the next week or so. But enough about me. Instead, you might take this opportunity to learn a little something about bicycle racing history and the fine example that Major Taylor set in his day. It's all there at http://www.majortaylorassociation.org/. All the results from the race are posted there as well. As for the full story of the race, I'll leave that to the professionals at the Worcester Telegram and Gazette: http://www.telegram.com/article/20080728/NEWS/807280662/1116. Thanks to Lynne Tolman of the Major Taylor Association, Peter Howard of Barney's Bikes in Worcester, and the fine folks of the Seven Hills Wheelmen for putting on a great event once again. See ya next year!